You are here: Home » New Orleans! This weekend I got the opportunity to do one of my favorite activities – play tour guide! 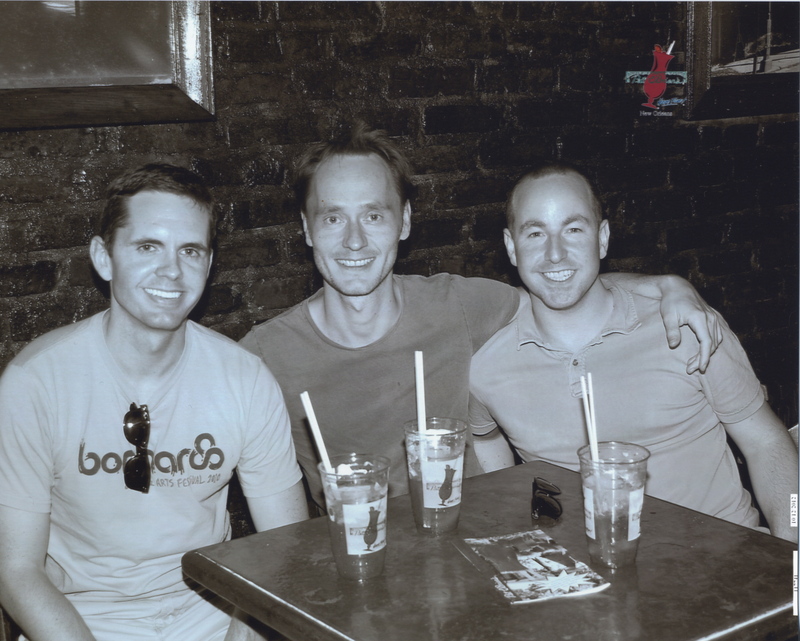 I was fortunate enough to show my friends from Amsterdam, Kjell and Walter around the Big Easy for a few days. I’m certainly not an expert on the city, but I have been there more than a few times over the years. It was a great trip, and it was fun to see it through the eyes of someone who not only had never been to New Orleans before, but actually had never been to the United States! Kjell and I meet a few years ago while I was in Amsterdam for work. He was gracious enough to take me on a walking tour of the city, and then invited me over for dinner the next night! 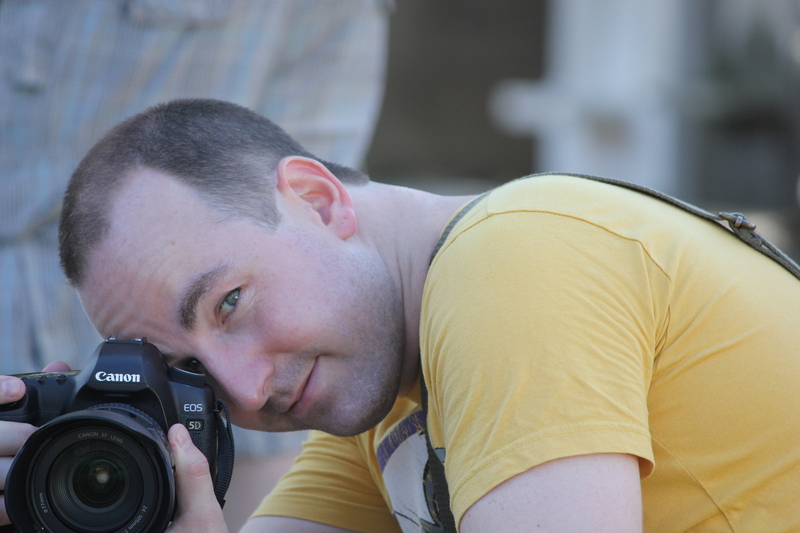 He’s a great guy, and an A-MAZ-ING photographer. He’s one of those people that seems to instinctly have an eye for framing a shot, and for life. For years now, I have been asking him to come to the States, and he has in a BIG way. He and his buddy, Walter, are doing a tour of the southeast, and have plans to hit every major point along the way. They flew into New Orleans, and I drove down to meet up with them. We stayed at the Cotton Exchange Hotel, a block from the French Quarter. I highly recommend that anyone headed down, check out the option of staying there. It isn’t the newest, hippest, coolest hotel in the city, but it is safe, clean, well appointed, and cheaper than everything in the quarter. The week before, I had done some thinking about things I thought a first timer in the city pretty much HAD to do. I also asked around to some of my friends from the city for suggestions and I put together a simple itinerary, and luckily it worked out perfectly. We all met up mid morning on Friday, and went right out into the Quarter, and we walked around a bit. I told them a bit about the city, Jackson Square, and the Mississippi River (the teacher in me doesn’t go away, even on vacation). 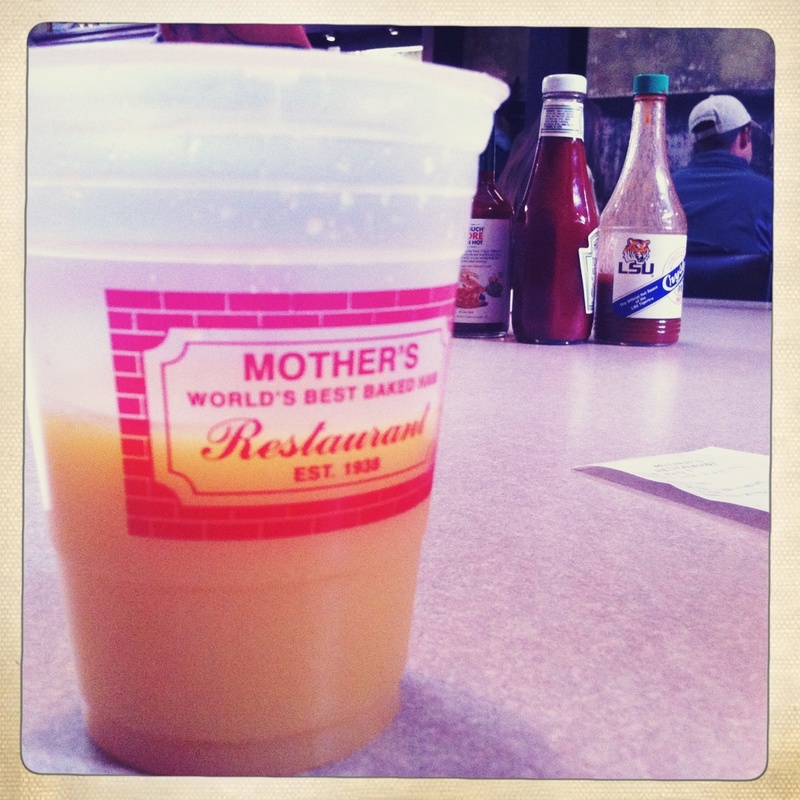 Then it was time to really experience New Orleans; and by “experience,” I mean eat and drink. We had lunch at the Gumbo Shop, one of my favorite restaurants, and they were introduced to their first po’boy sandwiches. Then we made it to Pat O’Briens, home of the Hurricane, just as the piano bar was opening. This was the perfect introduction for the guys to the real personality of the South, a world very different from Amsterdam. We carried on with the piano player for a while, made song requests, and had a few hurricanes. After that, the afternoon heat was in full effect and we decided to head back to the hotel for a nap. Later that evening we emerged, feeling better, and made our way back into the Quarter for dinner at Pierre Maspero’s, for rounds of jambalaya and red beans and rice. I think Kjell may have fallen in love a little with jambalaya. Later, on the way home from New Orleans, we stopped at a grocery store and he bought a couple of boxes of jambalaya mix to take back with him. We also had a round of Pimms cups. Techinically, we didn’t make it across the street to the Napoleon House, where the drink comes from, but we were looking at it, so I think that counts for something. It’s one of my favorite drinks, but I don’t think that either Walter or Kjell were much impressed. Cucumber and alcohol is a bit much for some people to take. Like with most drinks though, the closer you get to the bottom of the glass the better it tastes. 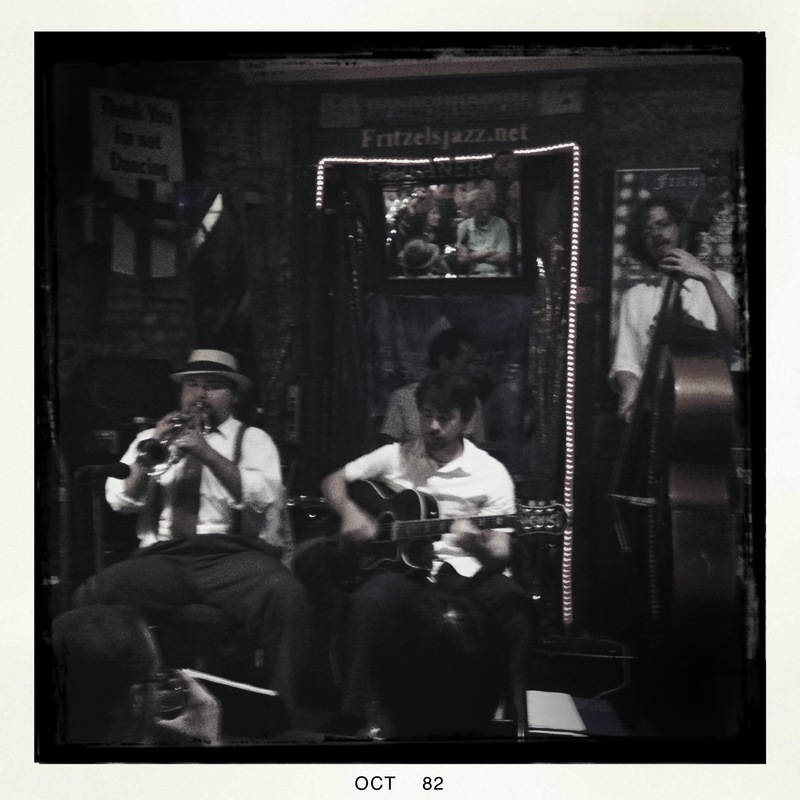 Then it was back over to Bourbon Street to Fritzel’s European Jazz Club. It’s a hole in the wall of a place, but it always has live Dixieland style jazz that is amazing to listen to. I’ve been going there every time I go to the city for years. There’s no cover, but the drinks are a minimum of $5.00, even for a Coke or water, but the music is so good, you won’t care. The next morning everyone slept in, then got up and went for a stroll over to Mother’s Diner for breakfast. Although the country style ham was a hit, Kjell didn’t really warm up the idea of grits, I’m sorry to say. Some things just don’t translate as well as we hope. Then it was on to the Garden District. We made our way through the business district of the city which was pretty much dead because it was Saturday morning, a concept that Walter, a city planner, found more than a bit puzzling. “Why doesn’t the city have mixed used areas?” he asked. I tried to explain the history of the city, the 20th Century ideas behind the design of that part of town (suburbs, commuting, etc.) but found myself wondering the same thing. 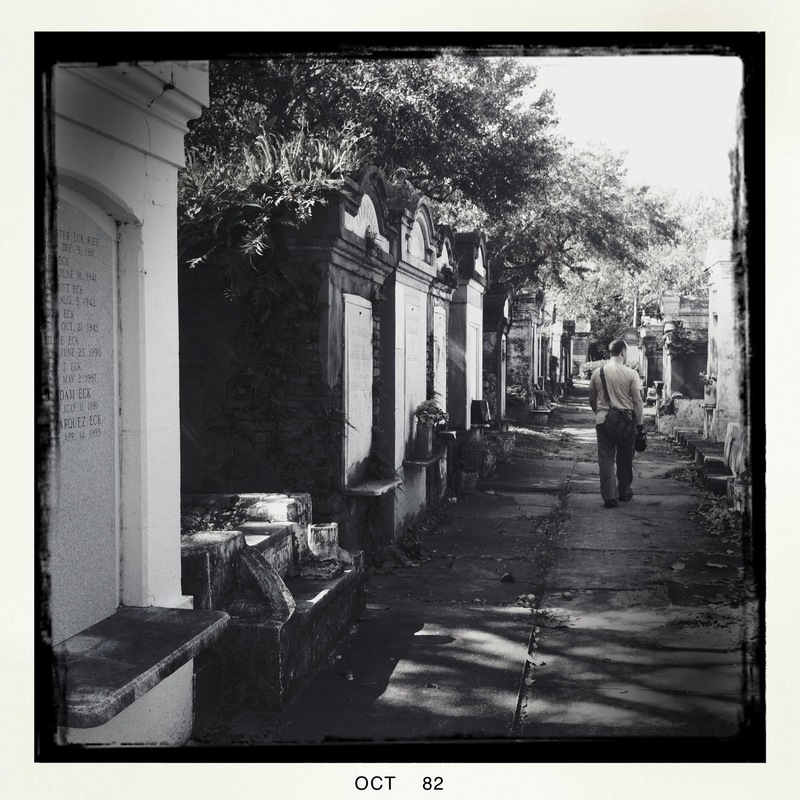 The tree-lined streets in the District were a relief from the heat of the midday sun, but the highlight was a trip through Lafayette Cemetery. It’s beauty and it’s decay made the for the perfect opportunity for Kjell to whip out his camera and take some incredible snapshots. Later on, we took the free ferry across the Mississippi, and walked along a levy, and then made the mistake of sitting down and having a Coke. We all slowly realized that we weren’t as young as we used to be, and a quick “disco nap” was in order so we could go out an conquer the night. We walked back to the hotel, and took the much needed nap, and then headed out again once the sun was setting. Our intention was to find a place for dinner that was more local, and after a few wild goose chases, we asked a local who pointed us in the direction of Mona Lisa’s, and Italian restaurant that is in the Quarter, but is far enough off of the beaten path that we were the only tourists there. It was exactly what we all needed. The food was great and the atmosphere couldn’t have been better. Hanging all over the walls are various pictures of the Mona Lisa, and there are even a few drawn by neighborhood kids. All of them lit by red chandeliers. 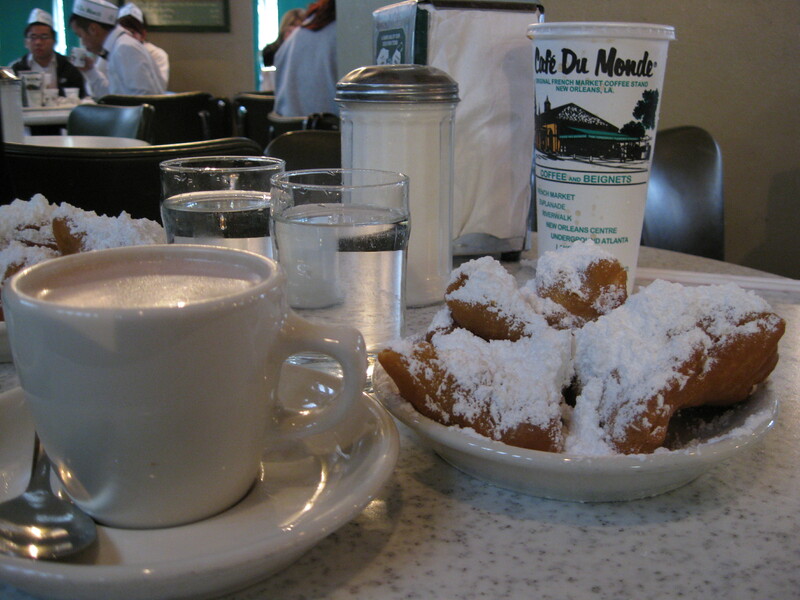 Sunday morning began with a trip to Café Du Monde and a round of beignets. We followed that up with a bit of last minute shopping for souvenirs. The time came for us to leave, though, and we jumped in the car, and headed north- they had the rest of the South to see.